Patch panels act as the central role in the administration of the telecommunication network. They form the primary link for collecting cables and routing data to the place where it needs to be. The most copper cables in network presently use Cat5e patch panel or Cat6 patch panel. However, there are various styles of Cat6 patch panels on market, like punch down or feed through patch panels. Consumers may be confused when they need to select one. Here I’d like to talk about Cat6 feed through patch panel and recommend some for your reference. Compared with punch down type, there is no need to punch down cables with feed through panel. Unlike the punch down panel that needs to punch down Ethernet cables for the rear side, feed through patch panel have RJ45 ports on both sides, making install cables is fairly simple. Though the price is a bit higher, the feed through panel saves time and energy for cable management. FS.COM offers feed through patch panels with different styles making them ideal for any installation in server racks. Here is a video to show the products. 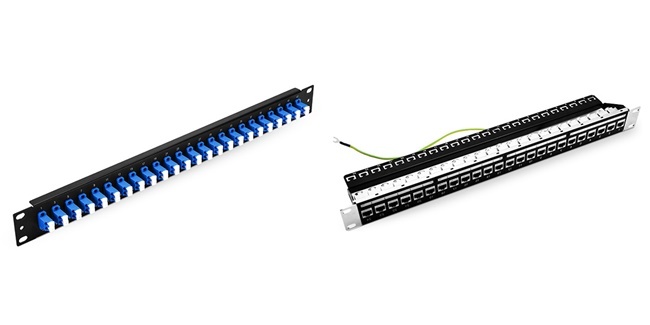 Unshielded patch panel is used to connect unshielded cables that actually with faster transmission in the absence of electromagnetic interference (EMI). The following is a 24 port Cat6 unshielded feed through patch panel at the price of 30 dollars. It meets Cat6 specifications and works with T568A and T568B wiring to comply with industry standards. 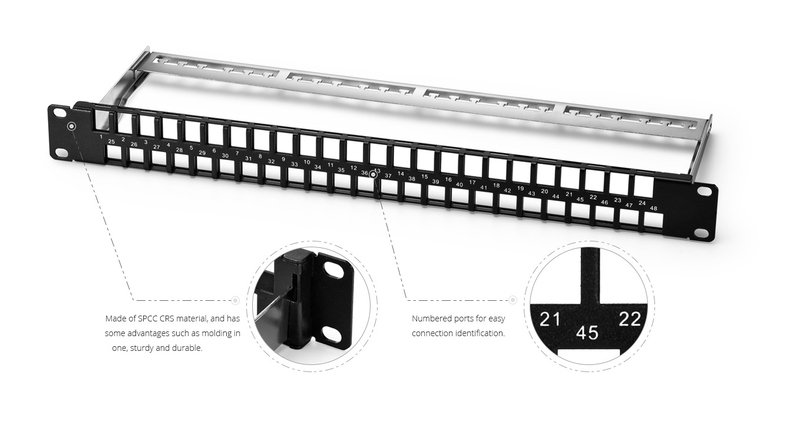 Made from SPCC+ABS plastics material, the Cat6 patch panel features 24 numbered ports to help you identify connections. And it’s supplied in black color. Shielded patch panels are recommended for high EMI environment, because shielded cables can more effectively block interference. Therefore, shielded panel is more expensive than unshielded one, this 24 port Cat6 shielded patch panel costs 43 dollars at FS.COM. Made to be efficient and durable, the Cat6 feed through patch panel is constructed with a fully enclosed, 6 port module design, which provides flexibility and protection of printed circuitry of termination. 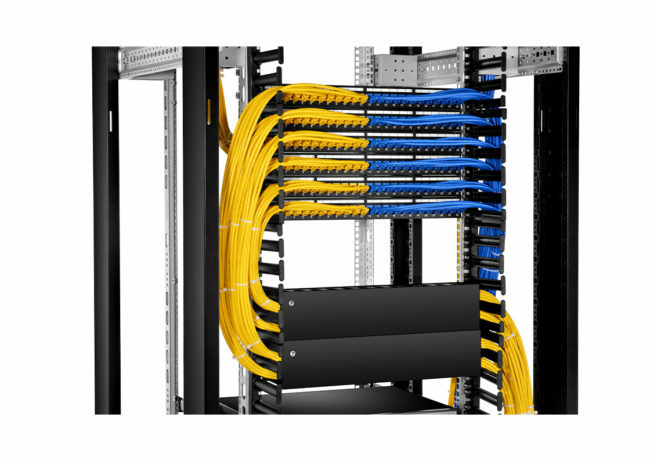 With a cable management bar on the rear, it helps Cat6 cables to pass through patch panel in a neat and organized way. To meet customers’ different usages, FS.COM produced blank keystone patch panels that are available in 24 port and 48 port. Here is the 48 port patch panel which offers unlimited flexibility and ease of installation to the customers. The port openings will accept both Cat5e and Cat6 insert modules, thus a mixed connection will be made. Designed with a stainless steel cable manager on the rear, this patch panel keeps cabling neat and tidy, and can mount to any standard 19 inch server rack. Beside, it has a favorable price of 11 dollars. To sum up, when you need to connect the unshielded cables choose the unshielded feed through patch panel, while use the shielded panel to link shielded cables. And if you want to make a mixed connection, choose the blank keystone design. FS.COM patch panel offering includes copper and fiber types which are in stock and ship the same over the world. Welcome to pick at FS.COM! This entry was posted in Cable Management and tagged blank keystone patch panel, Cat6 patch panel, shield patch panel, unshielded patch panel on August 2, 2018 by Sinead. Zhang.